Every year, videogames become a bigger part of Comic Con, as videogame developers and comic book writers draw more inspiration from each other. Several comic book characters have appeared in their own videogames such as Spider-man, Batman, and the Incredible Hulk. Likewise, comic book series have been inspired by video games, including one of Sony’s biggest franchises. The PlayStation Blog has just announced a partnership between Naughty Dog and DC Comics to release a series of comic books based on the Uncharted 3 story. UNCHARTED #1 launches Nathan Drake on a journey to the center of the earth on a quest to see the legendary ‘Amber Room.’ As enemies from Sir Francis Drake’s past come for revenge on his descendant, Drake must use all the skills at his disposal to stay one step ahead of the game. UNCHARTED #1 is written by Joshua Williamson (SUPERMAN/BATMAN), with fantastic art by Francesco Francavilla (DETECTIVE COMICS) and featuring covers by the legendary Adam Hughes. The comic series is scheduled to debut just in time for the release of UNCHARTED 3: Drake’s Deception in stores. 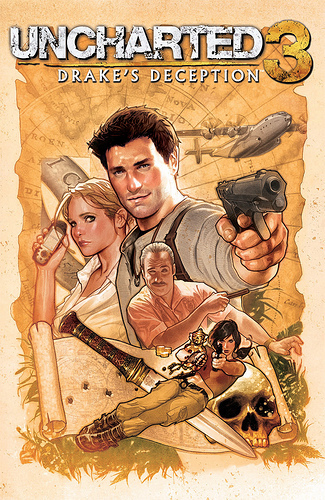 The post also goes on to say that Adam Hughes will be signing a limited-edition Uncharted cover art poster on Friday and Sunday during SDCC 2011. Below is a picture of the poster.